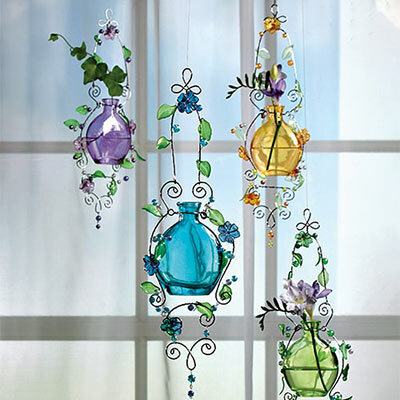 Pastel glass bottles are suspended by metal tendrils decorated in bright, acrylic beads, flowers and leaves. These Pastel Glass Rooters hold cuttings or bouquets and double as unique suncatchers. Wipe clean. Set of 4 includes one of each: purple, yellow, blue and green. Approx. 13½"l. Set of 4.